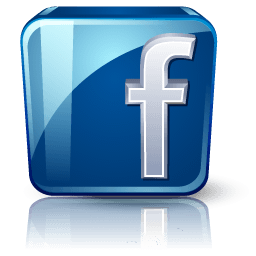 Check us out on Facebook and Like our Page!! and – Check out our new store on Amazon! When Dianne & Chuck Geier look at an old teaspoon, knife or fork, they envision a fine piece of jewelry or a unique gift idea for the home. From their New Lenox, Illinois studio, the “Spoon Lady” and her “Forkin’ Husband” fashion antique silverplate flatware into earrings, rings, pendants, barrettes, bracelets, wind chimes and other interesting custom silverware creations. 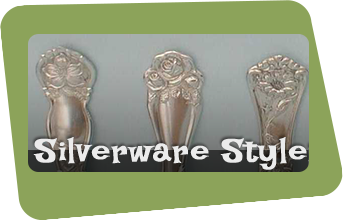 New items are constantly added to the list as the imagination of the artists and the character of the silverware dictate. In this case, recycling is not only good for our planet, but reveals beautiful “Silver Wares” to be enjoyed in an entirely new form. 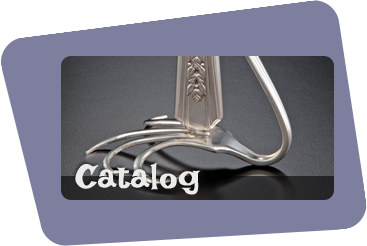 Browse our Catalog via the link above. If you would like to place an order for an item, simply click on the Order button beneath any of our Artistic Silver wares in a gallery. All of our pictured Artwork is recycled, silverplated Antiques. Sterling available on request, but the price will sure be different! 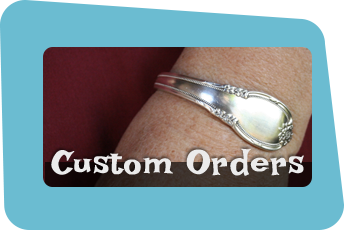 Go to the Custom Orders page to have our Artwork done with your own silverware! © 2013 The New Homestead Silverware Artistry. All Rights Reserved.